Trying out a new sound feature here on the blog. From my old Runner’s Digest radio show days in Boston I have untold hours of interviews and race calls from the first Running Boom era. The show ran weekly from 1977 to 1988. In this selection 1974 NCAA Cross Country champion Nick Rose of England discusses the use of fartlek training in a 1981 interview with me and Runner’s World editor Amby Burfoot. Let me hear if you’d like more “Blasts from the Past”. Toni – the first time I ever met you was to do an interview for the radio show. Would love to see more posted. I am enthused by your responses. I have been culling the Runner’s Digest library this afternoon, and have found one nugget after another. Walt, pics from Jeff J. would be invaluable. I’ll let you know what I’m working on, and see what you might have in a supporting role. Thanks for all the comments. Excellent! I have thousands of Jeff’s pictures digitized if they might help add to a program. Keep them coming.Passion and wisdom never gets old.Runners Digest still has a lot to offer. THANKS. Yup. Please post more. You had a great show. Toni- I loved this!! These should be a must for all coaches and aspiring coaches. Hey Toni, I hope that you keep these coming I know that you have a treasure trove from the show. You chose the perfect photo to accompany this audio memory. This NCAA race contained a breathtaking number of surges between Nick and Craig. 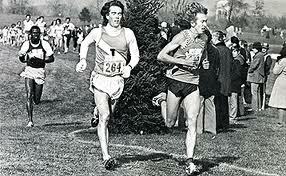 I think if forced to pick the most amazing running battle I’ve ever witnessed live I would choose this NCAA XC race. Unforgettable. I certainly would love to hear more of these, Tony!